by Bill Dwight on Wednesday, January 18, 2012 at 11:22 PM | LEAVE A COMMENT! A few months ago, I was invited to demonstrate FamZoo’s online youth financial education solution to credit union innovation leaders and executives from across the US and Canada. They were assembled in Kansas City at the “big.bright.minds” meeting hosted by the Filene Research Institute. I was delighted to have the opportunity to demo FamZoo to such a motivated, innovative, high energy group. 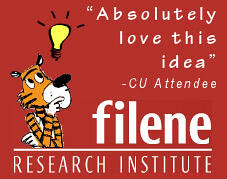 I was also intrigued to hear about all of the cutting edge projects driven by the Filene i3 working groups. Very cool. After the meeting, Filene sent me all of the anonymous feedback on my presentation. (Attendees were able to submit comments on presentations in real time to an internal site.) It just dawned on me (umm, duh!) that this feedback is one of the most credible sources of testimonial information we can offer to credit unions who are deciding whether FamZoo is worth a look. As proof of full transparency, I’m even including the handful of skeptical comments. Being a life-long engineering type, I’ve never been very comfortable with (or impressed by) much self-promotion, so that makes spreading the word about FamZoo a bit challenging at times. Since this comes directly from the mouths of attendees without any filtering on our part, I feel very good about passing it along. Here are all of the comments verbatim. Great tool to support credit union commitment to financial literacy. Incredible concept, had to do this manually growing up and would have loved to have this! I see this going viral very quickly! Absolutely love this idea! Can’t wait to talk to him more. Wonder if we can tie it to a gift card for older kids. Really like the concept. It should create better members. I will certainly sign up as this serves a big need as a parent of 2 young boys. Great example of innovation and how it is created. Totally sweet idea as a parent. Great tie for a credit union. Love this! He is so passionate about this. Parents MUST teach this at a young age, if you wait until you have bills, budgeting it is SO overwhelming! Trust me. I am trying to figure it all out now. Financial education is so important. FamZoo is a great idea and is of interest to us. Oooh....we want this! I really like that this fit so well with our spend share save philosophy. Love that it involves the parents so thoroughly. Love this for financial education for kids! Great idea with a unique, applicable approach...we’ll be trying at home for sure! Great product. I checked this out when I received my pre-reading. I like the fact that this is an interactive education tool that ties back to daily life. I also like that it is driven by the family and not the Financial Institution. Need more time to see how it might fit with our brand/strategy. May have an interest in participating. Like the concept. Ultimately we need to take all of this financial literacy stuff and consolidate. Going to get this to my brothers and sisters for their kids to try I hope. Great online content and partnering opportunity. I believe experiential learning programs work far better than other educational approaches. Wow. We couldn’t be more proud of those comments. This will only work with very committed parents. I wonder if any parents have actually learned along with children. Many of their parents have never had any financial training. All parents want to equip their kids with basic personal finance skills, particularly in today’s scary economic environment. Very, very few parents consider themselves financial experts. Parents are insanely busy. In fact, family life can be a real zoo! Get it? We’ve designed FamZoo with these three realities firmly in mind. We help you pass along personal finance fundamentals to your kids with minimal prerequisite knowledge and minimal effort. It’s mostly about instilling very simple, sound financial habits through consistent practice. Once you take a few minutes to set up FamZoo, the consistency comes along for the ride. That’s because many of the capabilities — allowance, compound interest, recurring payments, chore reminders, weekly progress reports, etc. — just chug along on auto-pilot while you’re off juggling family, work, and the rest of your busy life. From time to time, when those “financial moments” pop up with your child, FamZoo is right there for you — helping you encourage rational fiscal behavior without all the typical emotion. Do parents learn right along with their kids? You bet. Even those parents with a firm grasp of financial concepts often find that the process of collaborating with their kids improves their own personal finance habits. It’s a cool added bonus. I think it's novel and likely very applicable, but like PFM I don't know that it would be pervasively used. Point taken, but it’s a lot less effort than your traditional PFM tool (and those tools are getting easier and easier to use every year I might add). Kids just don’t have that many transactions to track, and virtually everything else is on auto-pilot (see comments above). It’s also more than a PFM tool. As far as kids are concerned, FamZoo is their credit union, and it holds their money. Technically, the accounts aren’t real — an account balance just represents an IOU from the parent to the child — but to a kid, that account balance is very real indeed. As a result, FamZoo is a very “sticky” application once families get started. Good learning tool for kids, but a bit over-the-top. I admit it. I packed a lot into this demo, showing back-to-back scenarios from my kids’ real-life experiences ranging from their young years all the way up through college. So, I’m not surprised if some found the presentation to be a bit overwhelming. The nice thing is you can start super, super simple. Then, as your child matures, you can add sophistication gradually as desired. Concerned about security and branding. Should a credit union let its member go somewhere else? What if a Bank buys Famzoo? Security: First off, we don’t keep any real bank account or payment information stored anywhere on our servers. Nobody can get at your real money through FamZoo. Even so, we take security very seriously, because we value the privacy of our families. We use industry best practices and robust underlying technology to protect the personally identifiable information (like email addresses) for our users when they choose to supply it — optional in all cases except for the registering parent. Got a specific security concern? Just contact us to discuss. Branding: Our Partner Edition allows you to easily mix in your own branding and targeted content along the top and sidebar of the FamZoo application pages using our self-service administrative console. You can also customize aspects of our default UI using your own (nerd alert!) CSS rules. Wondering if you can pull something off to meet your branding requirements? Contact us and let’s discuss. Being bought by a bank: Really? Can’t imagine that scenario. We think that partnering with a wide array of credit unions, banks, financial advisors, and other financial organizations will help us spread good money habits to more families, more efficiently. That’s consistent with our mission. Being beholden to a single bank is not. Can’t say it’s critical for the CU, but it should create better members. Fair enough. FamZoo isn’t critical in the sense that your credit union can certainly function without it. But, credit unions operate to serve their members, not to maximize profit. So, if you’re genuinely interested in the well-being of your member families, believe in the importance of youth financial education, want to start connecting with your next generation members, and want to be top of mind when they transition to real world financial products, I know you (and your families) are going to like FamZoo. It’s also super easy to roll out — no integration or IT fuss required. One of the big.bright.mind credit union attendees went live with FamZoo Partner Edition just last week. Will your credit union be next? Need more info about FamZoo Partner Edition? What is it? How does it work? What does it look like? Why is it good for my credit union and my members? How do I roll it out on our site? Check out this post. Ready to schedule a live demo for your credit union? CLICK HERE.